Alifesoft ivideo Studio will appear in the beginning of October. It is a landmark for many Mac uses and Alifesoft. Alifesoft iVideo Studio for Mac is a comprehensive app, combining video downloader and video converter together, which bring considerable convenience for Mac app users to download and convert their favorite videos and share them with more friends. ThisMac iVideo Studio is a brand-new app for Mac users. It has beautiful interface, creative design, and powerful functions. It has adopted many users' ideas, and aims to resolve many download problems and formats conversion difficulties. You can experience this wonderful iVideo Studio for Mac and try it in the beginning of this October. It gives us a brand-new experience to enjoy favorite movies. With this wonderful Alifesoft iVideo Studio for Mac, you can download any videos in any formats you like from YouTube, and play them on your computer, you can also convert the formats and watch them on your iPad, iPod, iPhone, blackberry etc device, and you can also upload all these videos to internet and share them with more friends. As to the function of this iVideo Studio, it will never make you disappoint.On one hand, iVideo Studio can be a free YouTube downloader for PC, you can download all videos from iMovie, YouTube, hulu etc. And you can play this movies derectly on your PC. On the other hand, it is a wonderful video converter. You can convert videos as you like, and choose right video formats for your output movies and transfer them to iPhone, iPod, iPad, Apple TV, iMovie, YouTube etc, and share these wonderful and interesting movies with more friends. When you convert all your movies, you preview them and take some interesting snapshots. Besides, you can edit any videos, such as trim, clip, and edit them. You can also add some special effects for these movies. Actually, Mac users can experience more professional apps to enjoy wonderful beloved movies, videos, music etc. 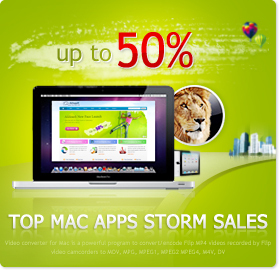 Alifesoft will aims to satisfying all Mac users and try its best to let users enjoy movies, videos, music etc conveniently.